Homosexual activity has been legal in Turkey since its founding in 1923. 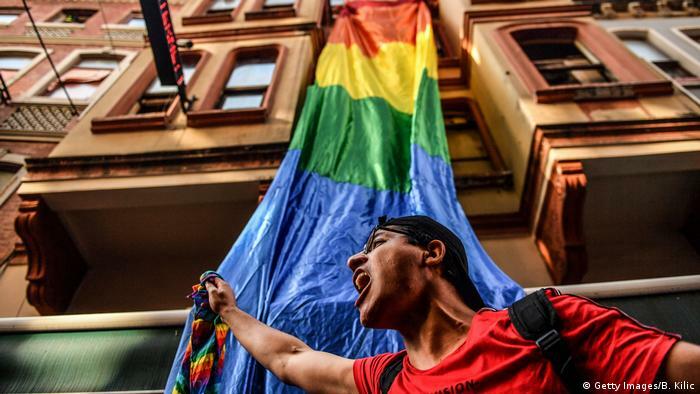 On Sunday, the LGBTQ+ community in the Muslim-majority city of Istanbul marched strongly during the annual Pride parade, despite the fact that Turkish authorities had banned the event for the fourth consecutive year. The occasion still saw around 1,000 people march for LGBTQ+ rights in the heart of the city near Taksim Square. Organizers had initially planned to hold the march in Istiklal Avenue, however, police warned activists against this, announcing that they would "use rubber bullets against those who tried accessing Istiklal Avenue". Human rights group Amnesty International in Turkey said 11 people had been detained, calling on authorities to release them immediately. Prior to the event, the Istanbul governorate told organizers that officials "could not take steps to secure their safety and did not find it appropriate for the Pride Walk to take place", according to AFP. "Running from the police, round 1"
Istanbul&apos;s Pride celebration has been taking place since 2003 and is considered to be the most high-profile event in any Muslim-majority country. "They will not be silenced"
Yet again, #istanbulpride has been banned. Yet again, the brave LGBTI* community has made clear they will not be silenced. That they will be visible today. One way or the other. "Empowering gay people goes against the values of our nation"
In 2017, at least 44 people were detained during a march for LGBTQ+ rights. "By banning the event, the Turkish authorities have failed to fulfill their positive obligation to guarantee both public security and the freedom of assembly, to which everyone is entitled, including LGBTI persons and other supporters of their rights," Nils Muiznieks, the Council of Europe&apos;s Commissioner for Human Rights, said at the time. In 2017, Turkey&apos;s President Recep Tayyip Erdoğan said empowering gay people goes "against the values of our nation," according to The Guardian. Homosexuality is not considered a crime in Turkey, however, there is no law that explicitly prohibits discrimination against an individual&apos;s sexual orientation or gender identity. Homosexual activity has been legal in Turkey since its founding in 1923, according to The Washington Post. However, the crackdown on the LGBTQ+ community in the country is ongoing. More than 40 "hate murders" against LGBTQ+ individuals were documented between 2010 and 2014. "Despite the tension, the atmosphere is amazing"